52 MATHEWS ROOKIE!!! When the Topps Bubble Gum Company released their landmark 1952 set, save the immortal #311 Mickey Mantle subject, they appropriately saved "the best for last" with the renowned #407 Eddie Mathews Rookie Card specimen. 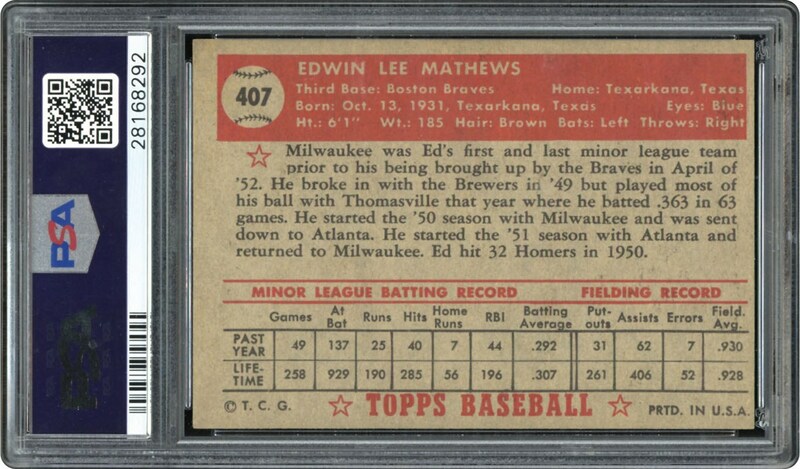 The final subject of the iconic Topps 1952 gathering, the #407 Eddie Mathews example suffices as one of the most significant post-WWII cards in the hobby, seldom surfacing in a super eye pleasing grade. 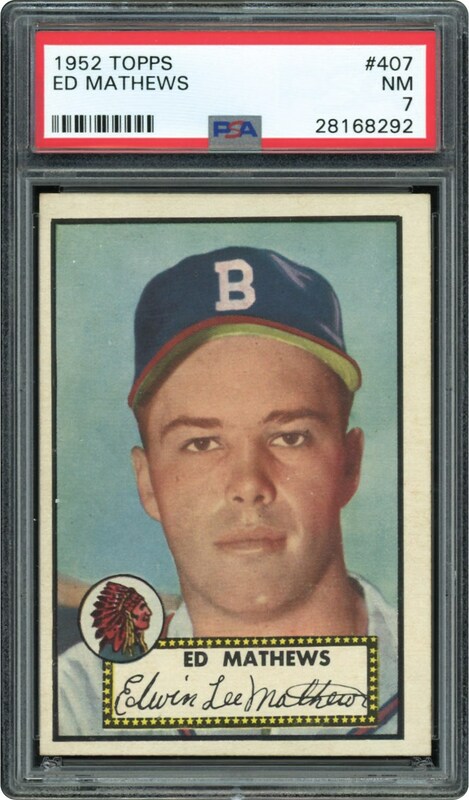 With that in mind, presented here is an outstanding 1952 Topps Eddie Mathews cardboard treasure residing in a "scarce for the grade" PSA 7 holder! No one would argue that any mid-grade or higher 1952 Topps Mathews is one of the most highly coveted and valuable post-war cards extant. The combined circumstances of Mathews elite Hall of Fame status as well as his 1952 Topps "high number" representation depicting his inaugural appearance on ANY cardboard issue have elevated this card to pinnacle status. A prestigious member of the 500 home run club, the nine-time all-star belted 512 lifetime dingers, and is widely considered the greatest 3rd baseman of his generation. In fact, until Mike Schmidt came along, he held the all-time 3rd base homer record with 486 round trippers. The classic Mathews portrait pose emanates outstanding registration and brilliant hues, set against a splendid powder blue background. Four square corners, no obtrusive surface blemishes, clean white borders and a fine verso complete this outstanding Matthews rookie card memento that merits a final resting place in any premier 1952 Topps gathering!